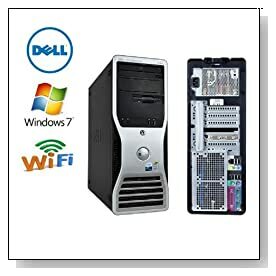 This is a grey and black refurbished Dell Precision 490 Workstation in a compact design offering power, performance and speed with its dual core Intel Xeon processor, 8GB memory and 1000GB hard drive for your most demanding specific professional software and games, maximizing productivity. Also being refurbished, it is offered at a greatly reduced price. Dell Precision 490 Workstation has a 2X Intel Xeon Quad Core E5504 64-bit processor (8MB Cache) at lower 2.0 GHz clock speed but increased 1333 MHz front side bus speeds for up to 8 cores in two sockets which means heaps more performance in demanding single or multi-threaded applications, 8 GB High Performance DDR2 SDRAM memory that is expandable to 32GB in 4 DIMM channels for super multitasking capability, 1TB Seagate HDD at 7200 rpm rotating speed that is both fast and spacious for all your videos, photos and common files and the beloved Windows 7 operating system's Professional 64-bit version that comes with a new OS disk for simple re-installation. Multi-core processor means different cores share the workload and complete the tasks in much less time. The system supports as many as 3 hard drives of 500 GB storage space each, so a total capacity of 1.5 terabytes for whether you want to back-up your data, save lots of big multimedia files or stripe data to enhance performance. The Dell Precision 490 Workstation system is designed as a whole to handle programs like CAD, GIS- geographic information system, advanced multimedia editing, engineering and things like medical imaging with OpenGL graphics, handling 2D and 3D applications smoothly. The system supports a double monitor configuration. Dell Precision 490 comes with an iCompNY Keyboard and mouse as well as 802.11 bgn wireless, Gigabit Ethernet with RJ-45 connector, 2 x 3.5mm audio line-in, 2 x 3.5mm audio line-out, 8 x USB2.0 ports, DVD/CD-RW optical drive, 2 x Serial, 1 x parallel and 2 x PS/2 ports, HDMI port for connecting to larger HDTVs, stereo line-in and headphone line-out at the back, microphone and headphone connector at the front, twin DVI-I output and VGA port to connect to monitors. Conclusion: Refurbished Dell Precision 490 Workstation is a great versatile, reliable and functional powerhouse kind of a system that is highly scaleable and upgradeable and helps you achieve great results in complex processes. Although it is packed with powerful features, is also an Energy Star compliant and energy efficient, despite working on a 750 watts power supply. It doesn't have a USB 3.0 port or Bluetooth (Bluetooth dongles cost a few dollars). Optical drives can be rotated vertically or horizontally for ideal functioning. It is reliable, fast and capable of running the advanced software and games, an overall great unit at a significantly reduced price and it doesn't seem like a purchasing decision you would regret.